This precision weigh-scale reference design achieves greater than 50,000 noise-free counts of resolution. 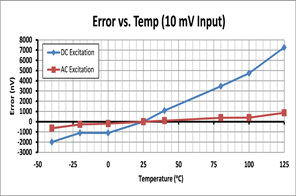 Offset and offset drift errors are nearly eliminated by ac bridge excitation. This design takes advantage of the high-resolution ADS1262 delta-sigma ADC. This robust circuit reference design includes theory, complete error analysis, component selection, simulation, PCB design, example code, and measured data that correlates with the theory and simulation.